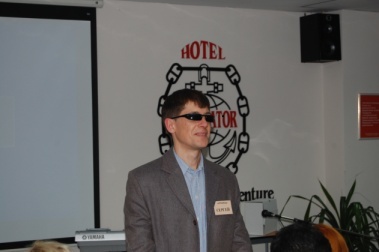 Sergey Kiselev, Chairman of Apparel - "Attitudes to people with disabilities are very negative in Russia"
In Kaliningrad there are no home help services, people who need practical help but cannot get help from relatives or friends live in institutions. Sergey Kiselev, Chairman of the Apparel would like to see personal assistance introduced in Russia. Apparel is currently working so that children with disabilities should be able to attend regular school classes and making advertisements in which people with disabilities tell about themselves. The Kaliningrad region is 15000 km2 (half the size of Belgium) and lies between Lithuania and Poland. The city of Kaliningrad, has about 600 000 inhabitants, 1 million people live in the area. After World War II the Soviet Union annexed the area from Germany and the Russians moved into the city. During the Soviet system all persons with disabilities lived in institutions, which is normal even today, almost twenty years after the Soviet Union. There is an almost total segregation according to Sergey Kiselev, president of Apparel a youth organization in Kaliningrad, which works for better conditions for persons with disabilities. "There are no adapted vehicles, workplaces or schools. We are currently working on a project where children with disabilities will be able to attend regular school classes, we believe that there should be such schools in all 22 districts in Kaliningrad." The conditions are very harsh for people who depend on practical help from others in their daily lives, for example, to get out of bed, wash or go to the toilet, " says Sergey Kiselev. "They mainly get help from relatives, neighbors or friends if there are any. " Sergey Kiselev notes that there is a system with social workers, but such help is only provided a few times a week and is limited to specific help at home, going to the post office, and similar errands. Sergey Kiselev is one of the founders of Apparel, which was founded ten years ago; five years ago his vision was damaged and he has experienced how his life has been restricted. Friends provide a considerable amount of support, but he feels there is a limit to what he can request. “I live near a gym where I like to exercise, but I don’t go there as often now even though it is only a kilometer away. My health has deteriorated somewhat over the past two years, but I’ve been lucky enough to live in a five-storey building so I can run up and down the stairs,” says Sergey Kiselev and smiles. An average monthly income in Kaliningrad is approximately 20 000 rubles (500 Euro). Sergey Kiselev has a pension of 5 700 rubles (140 Euro) and he says that it is possible to get a slightly higher pension if a relative or another person helps in daily life. "Then the pension is increased by a further quarter, 1400 rubles (35 euro), but if you take that money you get no help from social workers to shop and clean. " Can the extra pension be paid to someone who helps a person? "Yes, if a person chooses someone to help him, that person can get this extra amount of 1400 rubles. But if there is someone outside the family then the condition is that the person must be unemployed and below 50 years old. " Sergey Kiselev explains that it is mostly elderly people living alone who use this money to pay someone. Sergey Kiselev, however, is skeptical about the people that it is possible to hire. "Since there is so little money, people willing to work for this sum often have social problems. Many older people prefer to ask a neighbor than hire such workers." A young person with disabilities can only live in mainstream society if he or she has money to pay people or has relatives or friends who help, otherwise the person has to live a life in an institution says Sergey Kiselev. Minors live in special type of institution and when the person reaches 18 years, they are moved over to a new institution, now for adults. "We have institutions for the elderly and persons with disabilities. For example, in the city Pionersky a few kilometers from Kaliningrad 220 people live with approximately 180 staff in an institution, the conditions are tough because there is little opportunity for those who live there, it's clean storage, the people are stuck away and forgotten by society. " Sergey Kiselev is particularly upset about the conditions of children living in institutions because they get very little stimulation. "I have visited many people in the institutions and the doctors have told me that a major problem is the lack of social care. When the orphans got there, they have been disabled due to lack of care and stimulation, that is how our system works." The image in the media is very negative says Sergey Kiselev, and because of that Apparel makes commercials that are broadcast on television and in shopping malls. In the films successful people with disabilities talk about themselves in order to provide positive examples. "People are generally very negative towards people with disabilities, they are not used to seeing them on the streets, and many are even outraged if they are visible in the community. Since Soviet times, people are not accustomed to driving changes in society, they believe that change must come from above. " "That is why it's important for organizations like Apparel to act to change people's attitudes. Russia has not yet ratified the UN Convention on the Rights of Persons with Disabilities," says Sergey Kiselev hoping it will give more opportunities to assert the rights of persons with disabilities. "President Dmitry Medvedev has signed it, but it is not ratified, the ratification is promised in the spring of 2010, but we do not know." I tell Sergey Kiselev about personal assistance in Sweden, how it is possible for disabled people to get a certain number of assistance hours granted per day for the need to eat, dress themselves, wash themselves but also to work, be a parent, spending time with friends and so on.
" I think the help would be very welcome here. If resources and money are provided we could administer much of this within the existing NGOs. " "A lot, mostly people's attitudes, many who work in NGOs do not want to do too much, many are there primarily to show how good they are, if it gets too hard they stop. " I tell Sergey Kiselev about a person who said he was afraid that the assistants would dominate him. Sergey Kiselev agrees that there could be such a risk and that these concerns reflect the view of persons with disabilities. "People with disabilities are often seen as people who can not take responsibility for anything. In a system of personal assistance, there must be a very high level of control. I may need to sign checks or receipts in a bank, then maybe I do not know what documents I am given and what I sign. " Sergey Kiselev calls for help from other countries, in terms of knowledge of how a system of personal assistance works and how the system should be controlled. "In Kaliningrad, nobody knows how personal assistance works in Sweden or that life can be different. It is a long process to get people to change their views about what the opportunities for people with disabilities are, " said Sergey Kiselev.